Dress: Avenue. Jacket: Thrifted. 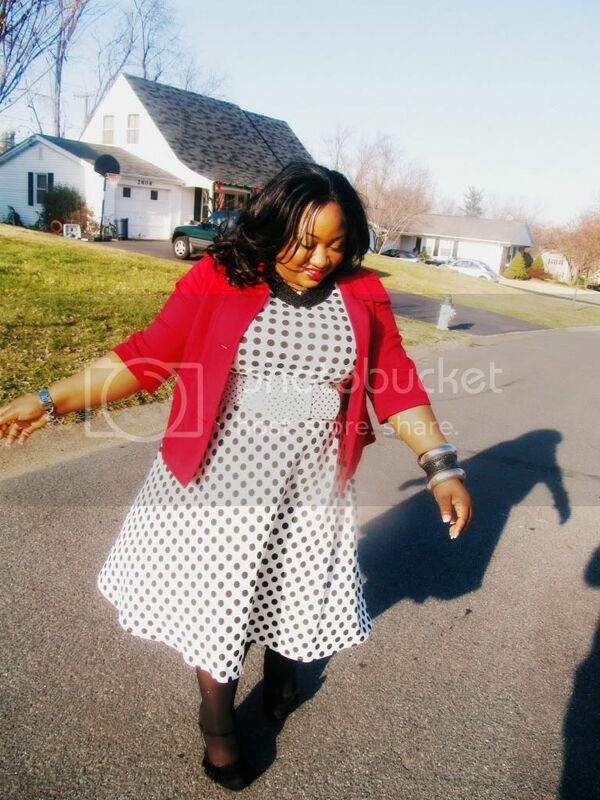 Shoes & Belt: Torrid. Bag: Chanel. Tights: Hue. Necklace: Macy's. Bracelets: AS. Watch: Lane Bryant. Hello lovelies, hope you had a relaxing weekend. So one fact about me, i dress up to church! I mean really dress up as in, primping and preping. i am definitely not the casual slacks and tee to church kinda girl. 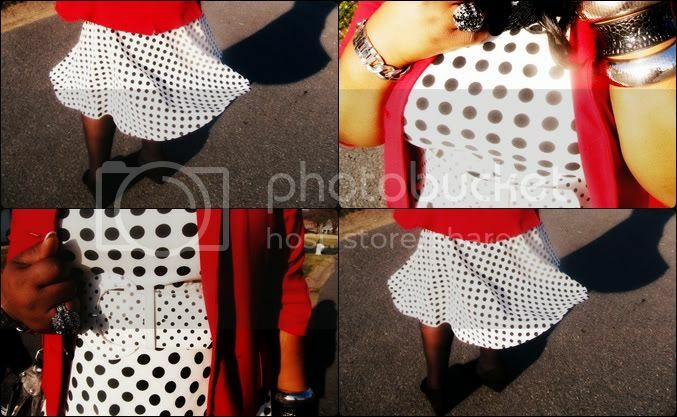 For this particular sunday, i decided to channel my inner Marilyn Monroe with this polka dotted dress from Avenue. Since i had a coupon, I only got this dress for $10. Steal! i know! lol. I decided to contrast the pattern of the dress with a polka dotted belt from Torrid and a red jacket that i thrifted for about $3! 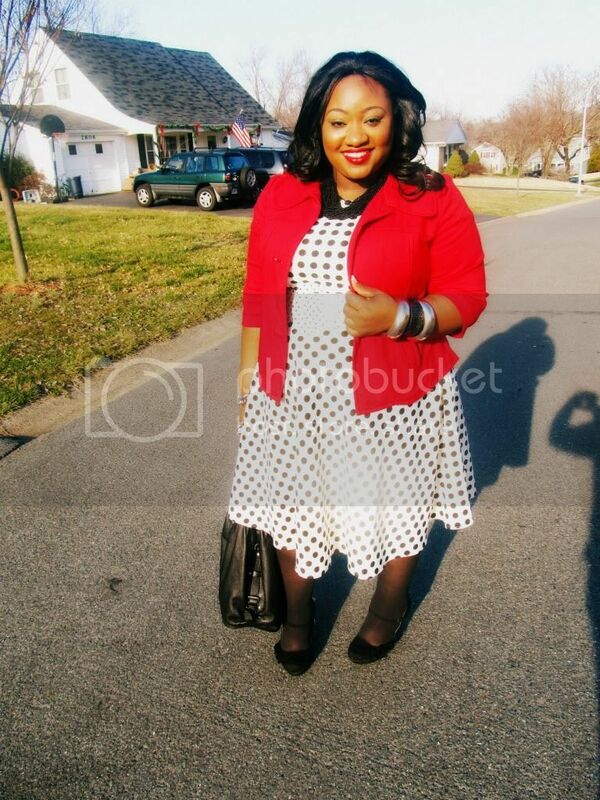 I initially wore this outfit with some matching red pumps but i thought it looked too cliche with the red and white and black, so i kept it simple with these black wedges from Torrid. Second fact about me, i loove accessories and my fave of the moment is this Chanel bag that i gifted myself with for Christmas. I almost did a whole post on this baby but i thought you guys wouldn't really want to hang around going through about 12 pics of a bag lol. But this is not just any bag, its THE bag lol. Anyways, thanks for hanging! kisses Bibi! You look marvelous darling ... Love the polka dots! You did this look great justice! 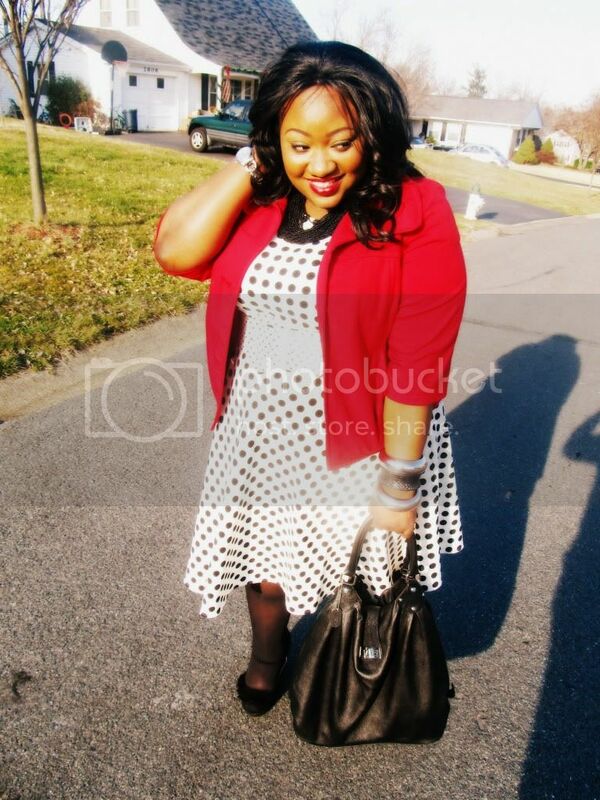 I love that polka dot dress paired with red! Such a cute looK! 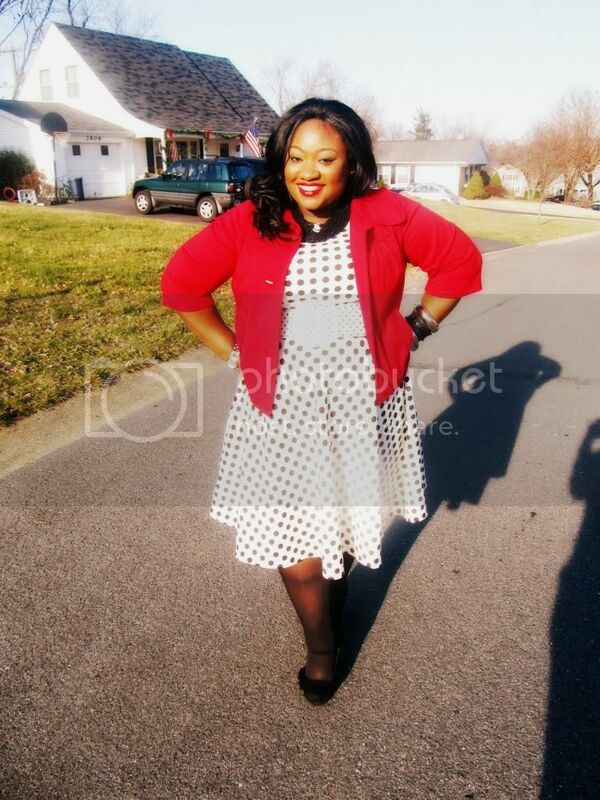 LOL..i was about to say the same thing about your dress - very Marilyn - cute - I love it with the red cardi. This is too Cute!!! I love the two different polka dot patterns!! I'm starting to beleive that Red goes with everything!! Can you be anymore gorgeous and cute!!?!? You look great! I absolutely love that dress. What kind of Coupon did you have to get that dress for $10? Lol. How adorable and sweet. Such a pretty dress. Love how the red jacket pops!!! 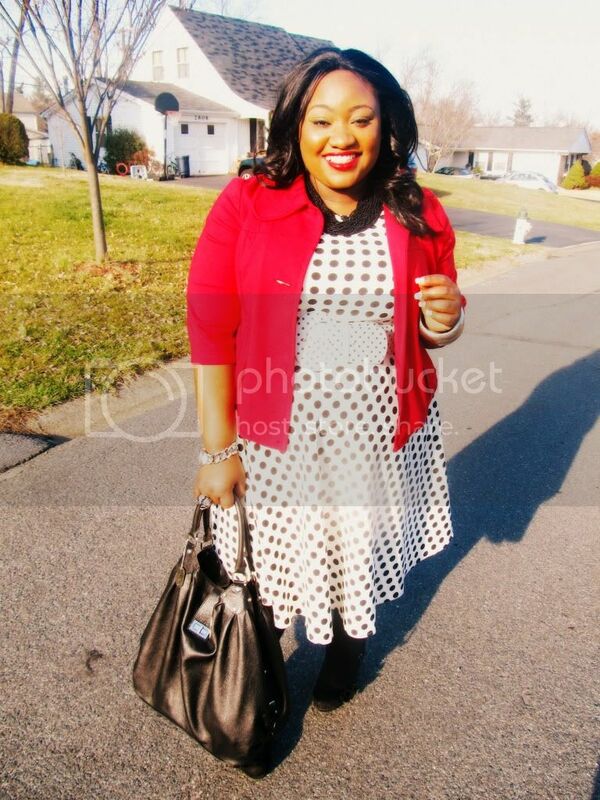 Love when polka dots are mixed with a bright color and you wore it so wear--great pop of color! 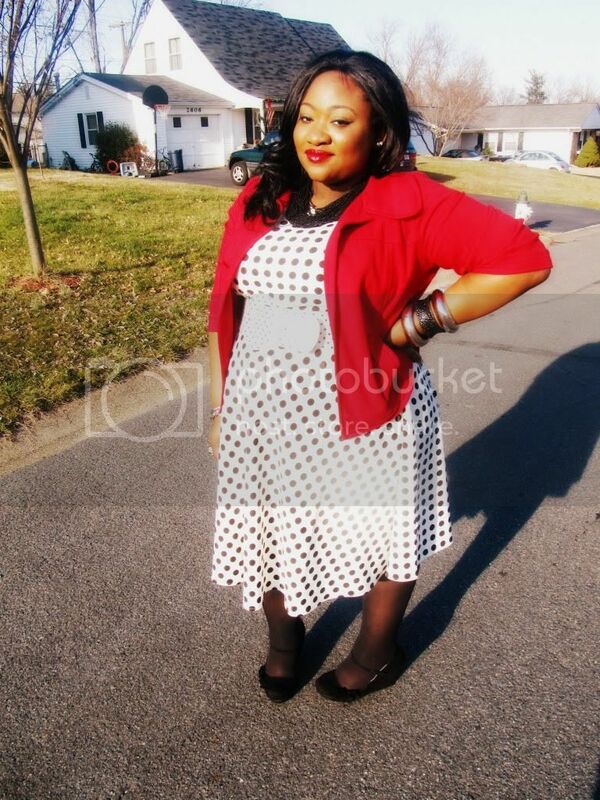 Let me find out I'm bout to hit up Avenue to locate that polka dot dress. (This is, of course, after my shopping ban is lifted). I'm not about that dressing up casual to church life, either. I always dress up. Always. I've just been raised that way to do so. This look is gorgeous! Very Marilyn-Esque I must say! Ummm, I would absolutely read a post and pic stalk a post about the Chanel. LOL! You have a new follower, bombshell!